If you’re planning to become a real estate sales agent in Bangladesh then your career is going to glide up to great height fetching you hefty profits. However, if you engage yourself in the right plans and procedures then this is only possible. And you need to have proficient knowledge about the field if you plan to enter into it. Not only will you get to hold the large responsibility of rendering the results exactly as promised but real estate business includes a lot of risk and uncertainty. But, it could be a turning point in anyone’s career provided the right start is made while becoming a real estate agent in Bangladesh. Moreover, a real estate businessman needs to come up with innovative ideas to excel in his field as like any other career option. Behind the strong demand for the housing market besides the demand-supply interaction, there are some other socio-economic reasons. The change in family structure is the most important one among the reasons. In the last two decades, nuclear families consisting of parents and one or two children have become more prevalent whereas in the past extended or joint families were the norm. The families find it convenient so that they like to live in apartments with two or three rooms. On the other hand, they get usually better services and security offered in apartments than other housing types. Also, there are spaces for community activities within the premises in most of the apartment complexes and high-rises. These reasons indicate the demand for the job of a real estate sales agent in Bangladesh and you can be that one. When you’re going to be a real estate sales agent in Bangladesh it’s not a matter how educated you are. The matter is that how you smart are while the selling is the main target in the business a real estate agent. But, if you’re educated for example, at least HSC then it’s better as some real estate companies may ask about your degree at the time of interview. Also, so you may have to take an additional course after being hired on with an agency as some real estate agencies have specific education requirements. Now, let’s talk about the salaries of real estate sales agent in Bangladesh and it’s the matter of commission upon sales. Apart from these, there are some real estate companies who offer anything between BDT 25,000 to BDT 30,000. But, you have a chance to earn as much as possible depending upon own dealing and goodwill in the market after gaining some on the job experience and starting own business. The prospects of a real estate sales agent in Bangladesh are bright as the growing economy comes with new scopes of construction works. When new industrial projects are set in the country the people are getting wealthy and getting their own housing. This is the business scope of the real estate industry and they can make new premises according to the demands. The business of real estate has fluctuated greatly after starting it in Bangladesh for four decades. Apart from these, the sector plays a major role in the national economy, which is contributing up to 7.08% of the national GDP. Also, the sector along with its linkage industries contributed about 12% to the national GDP that declared by Real Estate and Housing Association of Bangladesh (REHAB). 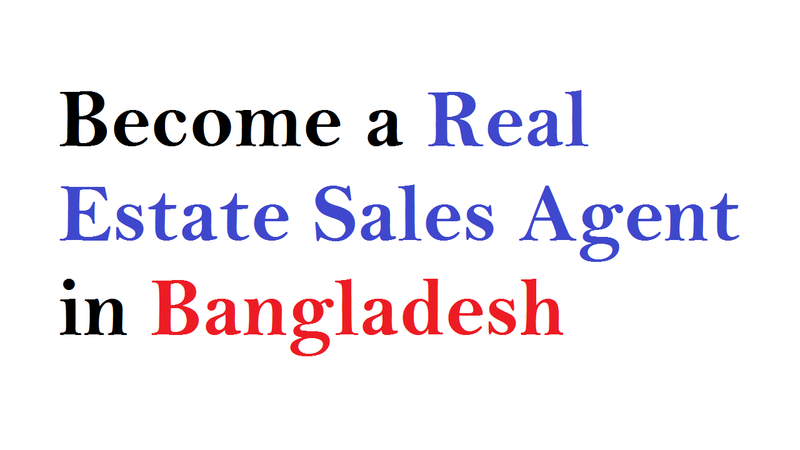 Now, let’s know how to become a real estate sales agent in Bangladesh. A real estate sales agent will need to upgrade their skills as their role evolves from just mere introducers to key service providers or facilitators of a real estate transaction to remain relevant. Based on their value-added offerings, this will enhance their credibility, as well as allow them to earn additional fees. The passion and drive to work with India’s demanding rich are the primary sets of skills that are required in this field. If you were working for a wealth management firm then other skills may be akin to what you may need to have. You must have a great portfolio and the best way to build your portfolio is twofold – one is to get a mentor, and another one is to use your personal network. Those who guide you towards buyer/seller contacts and splits commission are the best arrangement for a new agent is to find a mentor in the real estate agency. While gaining your first commission checks you’ll learn the profession from your mentor. Also, you can ask those who are considering buying or selling a home is a great way to begin networking among your friends and family for referrals of people. As someone’s always looking for a new home, so the referral may get you started in your new business. If you are looking for joining in the real estate industry as a real estate sales agent in then you can join a real estate brokerage agency. You’ll need to contact a broker before graduating from your training course since working with a broker is a requirement in order to practice as a real estate agent. When it comes to working in the field, as well as listing and selling homes the brokers have at least three years additional real estate training and can guide you through questions you have. Think about the size of the brokerage when you look for a broker along with its reputation and additional training offered. Also, you should check the reputations of brokerage house that you’re going to join. And you can do it visiting their site, reading the online comments about them. Also, you can ask your friends and neighbors whether they’ve experienced with.